Whatever your interest I will assist and support. I have years of dog training experience; obedience and therapy. We have several different options to offer in order to obtain a therapy puppy/dog including an Australian Labradoodles that has already been trained and has received it's CGC and Therapy jacket/certificate transferable into your name. Specialized training for specific needs can certificate the Australian Labradoodle with a Service certificate. 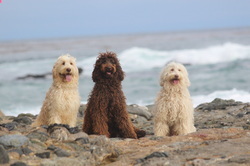 Please inquire if you would like one of our beautiful amazing temperament Australian Labradoodle to serve for you or your families special needs. OFA hip- Good, Elbow - Normal. Clear Juvinele Cataracts for both girls.